Gerber are an Oregon-based maker of hand tools and outdoors equipment. This post is a review of the Gerber Freescape hatchet, a 17.5-inch axe with a composite handle and solid construction. It has a sleek black PTFE coating on the axehead to reduce friction and prevent it from getting stuck in wood. This makes chopping wood much easier and faster. You won’t be breaking your chopping flow to wrench the axe out of the wood you’re cutting or splitting every few swings. The Gerber Freescape will take a beating – the handle is molded around the axehead, so it won’t be coming loose – you can also baton the back of the axe without worrying about the eye deforming. And, with half of the handle being bright green in color, it’ll will be hard to lose track of wherever you take it in the great outdoors. Finally, the axe comes with a sturdy green plastic sheath that matches the cover of the handle so that you can stored your axe safely when not in use, without worrying about it biting you or your gear. Check out the Gerber Freescape hatchet's price or order now by clicking here! The Gerber Freescape hatchet is 17.5 inches long. It weighs, according to Gerber, 32.6 ounces (just over 2 lbs) but packs more punch than you might expect from an axe in its weight category. That’s because the composite handle (glass-filled nylon) is lighter than wood. Thus the weight of the axehead represents more of the total weight than in wooden-handled axes of the same overall weight. That means extra heft and extra bite. The balance and handling of the Freescape hatchet is absolutely fine, as well. I own the Fiskars X10, which is nearly the same exact model under a different brand name and of a different color, and that axe handles very well. The steel of the axehead itself is rated at 55 HRC and is a high carbon steel. This means that it takes an edge easily, but is a bit soft, so you’ll need to sharpen it regularly to keep it in good working order. It also means that you should take care not to allow moisture to stay on it for too long, as the high carbon level makes for faster rusting if you do. But then again, you shouldn’t leave any axe wet, whether it’s low or high-carbon steel. In any case, the steel is of a good quality – it’s made in Finland, which is known for its rich tradition of toolmaking and high standards, but does require some maintenance after use. A hammer face on the reverse side of the poll is great for driving stakes, and there’s no worry about batoning the Gerber as there is no eye of the axe that can deform – the handle is molded around the axehead itself and is extraordinarily sturdy. The composite handle material is designed to reduce shock from traveling into your hands and wrists with each strike (or overstrike), which is a welcome feature as cheap fiberglass handles do not dampen shock as much as axes with wood handles. But Gerber have designed and made the Freescape hatchet in such a way that its handle does reduce shock, which is so important for regular axe users, seniors, or people whose joints or bones are troubling them. The geometry of the axehead (a wider profile aka “fatter cheeks”) makes it a great splitter, but it cuts equally well, too. That’s in large part due to its high carbon steel makeup, which allows you to get it really sharp, as well as a PTFE coating which means deeper cuts and less getting stuck in the wood. Almost the same axe – same company, almost same design and build, but the Gerber is 3.5 inches longer. Thus more possible to use it two-handed and you can put more power into the swing. I prefer it over the X7 as I like to be able to grip the handle comfortably with two hands and the 14 inch handle of the X7 is a bit too short for my liking and comfortable use. The Freescape hatchet’s handle, on the other hand, is very good as a camp axe – long enough to really get into a swing (even with two hands), but short and light enough that using it with one hand for the small tasks that make up the bulk of camp work is possible and easy to sustain even for long periods of time. 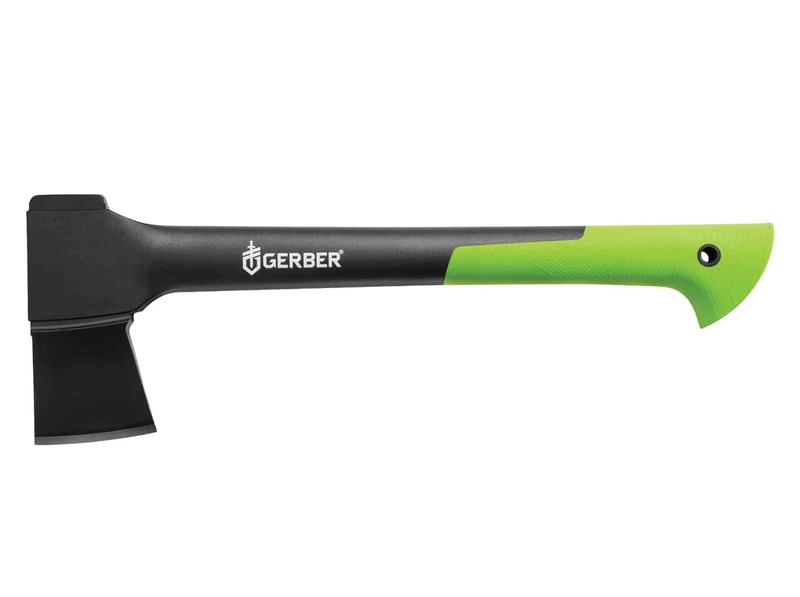 The Gerber Freescape Hatchet is most similar to the Fiskars X10 – they are basically the same axe. One reason why you can’t find the Fiskars X10 on Amazon, I think, is because it is simply being sold as the Freescape hatchet under the Gerber brand name. Why? I’m not sure, either – but the axes really are the same models, they just come in different colors. Overall, the Gerber Freescape hatchet is a good tool for a great price. It’s a real workhorse, and while the quality of the steel isn’t the same as, say, that of a Gransfors Bruks axe, it’ll cut and split faithfully for many years, as long as you take basic care of it such as sharpening it after sustained or heavy use and keeping it dry and safe from the elements. Check out the price or order on Amazon by clicking here. Thanks for reading!